“……….. General Secretary Mikhail Gorbachev was informed that there had been an explosion and fire at the plant but that the reactor itself had not been seriously damaged. No one wanted to be the bearer of catastrophic news. When the occasional official raised the question of whether to warn civilians and evacuate the city of Pripyat, which had been built to house workers from the Chernobyl plant, he was admonished to wait for higher-ups to make a decision and for a committee to be formed. Panic and embarrassment were of greater concern than public safety. The KGB cut Pripyat’s intercity telephone lines and prevented residents from leaving, as part of the effort to keep news of the disaster from spreading. Some locals were savvy enough to try to leave on their own. But with no public warning, many didn’t take even the minimal precaution of staying indoors with the windows shut. One man was happily sunbathing the next morning, pleased by the speed with which he was tanning. He was soon in the hospital. Moscow officials eventually realized that the reactor had exploded, and that there was an imminent risk of another, much larger explosion. More than thirty-six hours after the initial meltdown, Pripyat was evacuated. Columns of Kiev city buses had been sent to wait for evacuees on the outskirts of the city, absorbing radiation while plans were debated. These radioactive buses deposited their radioactive passengers in villages chosen to house the refugees, then returned to their regular routes in Kiev. Over the next two weeks, another 75,000 people were resettled from the thirty-kilometer area around Pripyat, which was to become known as the “Exclusion Zone,” and which remains almost uninhabited to this day. The Soviet system began to marshal its vast human resources to “liquidate” the disaster. Many efforts to stop the fire in the reactor only made matters worse by triggering new reactions or creating toxic smoke, but doing nothing was not an option. Pilots, soldiers, firefighters, and scientists volunteered, exposing themselves to huge doses of radiation. (Many others fled from the scene.) They were rewarded with cash bonuses, cars, and apartments, and some were made “Hero of the Soviet Union” or “Hero of Ukraine,” but many became invalids or didn’t live to see their new homes. The radiation levels were so high that they made the electronics in robots fail, so “biorobots”—people in makeshift lead protective gear—did the work of clearing the area. On April 28, a radioactive cloud reached Scandinavia. After attempts at denial, the Soviet government conceded that there had been an accident. Western journalists soon began reporting alarming estimates of Chernobyl casualties. To maintain the illusion that the accident was already under control, Moscow ordered Ukrainians to continue with the planned May Day parade in Kiev, about eighty miles away, thus exposing huge numbers of people—including many children—to radioactive fallout. Thanks to word of mouth and to their well-honed skill at reading between the lines of official declarations, however, Kiev residents were already fleeing. By early May, the exodus had grown so large that it became almost impossible to buy a plane, train, or bus ticket out of the city. Tens of thousands of residents left even before the official order to evacuate children was issued, far too late, on May 15. Thousands of people were treated for radiation exposure in Soviet hospitals by the end of the summer of 1986, but the Soviet press was allowed to report only on the hospitalizations of the Chernobyl firemen and plant operators. A few decades later, it seemed to many that the world’s worst nuclear disaster had caused surprisingly little long-term damage. The official toll is now between thirty-one and fifty-four deaths from acute radiation poisoning (among plant workers and firefighters), doubled leukemia rates among those exposed to exceptionally high radiation levels during the disaster response, and several thousand cases of thyroid cancer—highly treatable, very rarely fatal—among children. Pripyat became a spooky tourist site. In the Exclusion Zone, one could soon see wolves, elk, lynx, brown bears, and birds of prey that had almost disappeared from the area before Chernobyl; some visitors described it as a kind of radioactive Eden, proof of nature’s resiliency. But striking differences in new books about Chernobyl by Kate Brown, Adam Higginbotham, and Serhii Plokhy show that there are still many ways to tell this story, and that the lessons of Chernobyl remain unresolved. Both Plokhy and Higginbotham devote their first sections to dramatic reconstructions of the disaster at the plant. Sketches of loving family life or youthful ambition introduce the central figures, making us queasy with dread. The two authors’ minute-by-minute descriptions of the reactor meltdown and its aftermath are as gripping as any thriller and employ similar techniques: the moments of horrified realization, the heroic races against time. The prescient 1979 film The China Syndrome, about a barely averted disaster at a nuclear plant and its cover-up, is mentioned in both books. The movie’s title comes from a former Manhattan Project scientist’s hypothetical discussion of a reactor meltdown in North America causing fuel to burn its way through the globe to China. Though that specific scenario was clearly impossible, “China syndrome” became shorthand for anxieties about nuclear material burning through the foundations of the Chernobyl plant and entering the water table, the Dnieper River Basin, and then the Black Sea. Plokhy, a historian of Ukraine, provides a masterful account of how the USSR’s bureaucratic dysfunction, censorship, and impossible economic targets produced the disaster and hindered the response to it. Though the Soviets held a show trial to pin responsibility on three plant employees, Plokhy makes plain the absurdity of holding individuals accountable for what was clearly a systemic failure……. For Plokhy, the greatest lesson of Chernobyl is the danger of authoritarianism. The secretive Soviet Union’s need to look invincible led it to conceal the many nuclear accidents that preceded Chernobyl, instead of using studies of them to improve safety. …. Once the reactor exploded, Soviet censorship kept citizens in the dark about the disaster, preventing them from taking measures to protect themselves. we should be alarmed about the ongoing consequences of nuclear leaks and the risk of new nuclear disasters. Higginbotham points out that the United States now operates a hundred nuclear power reactors, including the one at Three Mile Island that suffered a serious accident in 1979, just twelve days after the release of The China Syndrome. France generates 75 percent of its electricity from nuclear power plants, and China operates thirty-nine nuclear power plants and is building twenty more. Some people see nuclear power plants, which do not emit any carbon dioxide, as the most feasible way of limiting climate change, and new reactor models promise to be safer, more efficient, and less poisonous. But what if something goes wrong? And what about nuclear waste? There are hundreds of nuclear waste sites in the US alone. In February the Environmental Protection Agency ordered the excavation of a landfill near St. Louis containing nuclear waste, dumped illegally, that dated back to the Manhattan Project. For years, an underground fire has been burning a few thousand feet from the dump. It took the federal government twenty-seven years to reach a decision about how to deal with this nuclear waste dump near a major metropolitan area, yet we fault the Soviet government for its inadequate response to a nuclear meltdown that unfolded in a matter of minutes. US failure to adequately address longstanding hazards—not to mention the slow-motion catastrophe of climate change—is yet another indication that poor disaster response is hardly unique to authoritarian regimes. Should the U.S. Revive Nuclear Energy?, NYT Len Charlap, 10 Apr 19, Princeton, N.J. I will support nuclear power the day after the Price-Anderson Nuclear Industries Indemnity Act is repealed. If insurance company actuaries consider nuclear power to be so dangerous that they cannot compute premiums that the industry can afford, then that industry is not economically viable. If the government (i.e., taxpayers) has to cover the industry with catastrophic insurance, then the government should own the reactors and provide nonprofit energy. Since the early 1950s, the United States and Russia have had numerous accidents with their nuclear bombs, and a number have even gone missing. By Marcia Wendorf, April, 06th 2019 “Broken Arrow” is the name given to nuclear weapon accidents, whether they be by accidental launching, firing, detonating, theft or loss of the weapon. The U.S. admits to having 32 broken arrows worldwide, with six nuclear weapons having been lost and never recovered. In the simplest terms, the way a nuclear weapon works is that a chemical high explosive compresses nuclear material until a critical mass is reached and fission is achieved. During fission, the nuclei of certain heavy atoms split into smaller, lighter nuclei, and release excess energy in the process. In some elements, such as certain isotopes of uranium and plutonium, the fission process releases excess neutrons which trigger a chain reaction if they’re absorbed by nearby atoms. Thermonuclear weapons (hydrogen bombs) utilize a different process, that of fusion. When exposed to extremely high temperatures and pressures, some lightweight nuclei can fuse together to form heavier nuclei, releasing energy in the process. Those high temperatures and pressures are achieved by fission, so the trigger for a thermonuclear weapon is a nuclear weapon. The first broken arrow occurred on February 14, 1950, when a U.S. Convair B-36 en route from Eielson Air Force Base near Fairbanks, Alaska to Carswell AFB in Fort Worth, Texas, crashed in northern British Columbia after jettisoning a Mark 4 nuclear bomb into the Pacific Ocean. The bomb was never found, and it contained a substantial amount of natural uranium plus 5,000 pounds (2,300 kg) of high explosives. According to the U.S. Air Force, the bomb didn’t contain the plutonium core necessary for a nuclear detonation. This was the first loss of a nuclear weapon in history. On April 11, 1950, a B-29 bomber carrying a nuclear weapon, four spare detonators, and a crew of 13 crashed into a mountain near Albuquerque, New Mexico. The bomb’s high explosives detonated and the nuclear capsule was damaged but it was recovered. All thirteen crew members onboard the aircraft died. On August 5, 1950 at Fairfield-Suisun AFB, California, a B-29 bomber carrying a Mark 4 nuclear bomb experienced problems with two of its propellers and crashed while attempting an emergency landing. In the ensuing fire, the bomb’s high explosives detonated and killed 19 crew members and rescue personnel. On November 10, 1950, near Riviere-du-Loup, Quebec, Canada, which is about 300 miles northeast of Montreal, a U.S. B-50 aircraft jettisoned a Mark 4 nuclear bombover the St. Lawrence River. The weapon’s high explosive detonated on impact, but the core was lacking a necessary component and did not detonate. The explosion did scatter almost 100 pounds (45 kg) of uranium. The airplane went on to land safely. On March 10, 1956, a a B-47 aircraft, carrying three crewmen and two nuclear cores from MacDill Air Force Base near Tampa, Florida, was en-route to Ben Guerir Air Base, Morocco, and had completed its first aerial refueling without incident. It failed to make contact with the tanker for a second refueling somewhere over the Mediterranean Sea, and it was reported missing. The kind of weapons the plane was carrying remains undisclosed, but the type of nuclear bombs commonly carried by B-47s was the Mark 15, which would have had a combined yield of 3.4 megatons. No trace of the plane or the two nuclear cores has ever been found. On July 27, 1956, a U.S. B-47 bomber was on a training exercise when it crashed into a nuclear weapons storage facility at the Lakenheath Air Base in Suffolk, England. The entire crew of the aircraft was killed. Known as an “igloo”, the storage facility contained three Mark 6 nuclear bombs, one of whose detonators had been sheared off in the accident. Investigators concluded that it was a miracle that the bomb hadn’t exploded. On May 22, 1957, a plane was transporting a nuclear bomb to Kirtland Air Force Base when suddenly, the bomb fell through the bomb bay doors and crashed into a field near Albuquerque, New Mexico. The bomb’s high explosives detonated, creating a crater 12 feet deep and 25 feet wide, however, the nuclear capsule was found intact. The only casualty was a cow who had been grazing close to the crash site. On July 28, 1957, a U.S. Air Force C-124 aircraft from Dover Air Force Base, Delaware was carrying three nuclear bombs over the Atlantic Ocean. The plane experienced a loss of power, and the crew jettisoned two nuclear bombs into the ocean, and they have never been recovered. On October 11, 1957, a plane carrying a nuclear bomb crashed on takeoff at Homestead Air Force Base, Florida. The plane burned for four hours, and the high explosives detonated, however, the nuclear capsule and its carrying case were found intact and only slightly damaged. On February 5, 1958, near Savannah, Georgia, during a practice exercise, an F-86 fighter plane collided with a B-47 bomber that was carrying a 7,600-pound (3,400 kg) Mark 15 nuclear bomb. 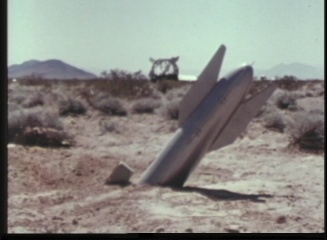 The F-86 crashed after the pilot ejected from the plane. The crew of the B-47 requested permission to jettison the bomb in order to reduce weight and prevent the bomb from exploding during an emergency landing. The bomb was jettisoned at 7,200 feet (2,200 m) over the Wassaw Sound off the shores of Tybee Island. Subsequent searches failed to locate the weapon. It is not known if the bomb had its plutonium trigger, but if it did, the blast effects of a detonation would have been a fireball having a radius of 1.2 miles (2 km) and thermal radiation causing third-degree burns for 12 miles. On March 11, 1958, a U.S. Air Force Boeing B-47E-LM Stratojet took off from Savannah, Georgia, and was scheduled to fly to the U.K. The aircraft was carrying nuclear weapons in case a war with the Soviet Union broke out. Captain Earl Koehler noticed a fault light in the cockpit, indicating that the bomb harness locking pin had not engaged. He sent Captain Bruce Kulka to the bomb bay area to fix the problem. As Kulka reached around the bomb to pull himself up, he mistakenly grabbed the emergency release pin, and the Mark 6 bomb dropped onto the bomb bay doors. The bomb’s weight forced the doors open, and the bomb dropped 15,000 ft (4,600 m) to the ground. Two sisters, six-year-old Helen and nine-year-old Frances Gregg, along with their nine-year-old cousin Ella Davies, were playing 200 yards (180 m) from a playhouse their father had built for them. The bomb struck the playhouse, its high explosives detonated and it created a crater 70 feet (21 m) wide and 35 feet (11 m) deep. Fortunately, the fissile nuclear core had been stored elsewhere on the plane. All three children were hurt, as were their father, mother and brother. The family sued the Air Force and received US $54,000. Today, the crater is still visible although overgrown by vegetation. Sometime in 1958, a B-47 aircraft carrying a nuclear weapon inadvertently released the bomb over Mars Bluff, South Carolina. Luckily, the bomb lacked the fissile nuclear core, but the conventional explosives detonated, injuring six people and damaging buildings. At a U.S. air base at Greenham Common, England on February 28, 1958, a B-47 carrying a nuclear weapon caught fire and completely burned. While the weapon didn’t explode, in 1960, a group of scientists found high levels of radioactive contamination at the base. The U.S. government has disclosed no further information about the incident. On November 4, 1958, at Dyess Air Force Base in Texas, a plane carrying a nuclear weapon burst into flames during takeoff. The weapon’s high explosives detonated, killing a crewman, but the nuclear core remained intact. Only half a mile from the crash site was Butterfield Elementary School. On November 26, 1958, at Chennault Air Force Base, Louisiana, a B-47 carrying one nuclear weapon caught fire while on the ground. This fire damaged the nuclear capsule and its protective case, and there was nuclear contamination of the area. In Hardinsberg, Kentucky, on October 15, 1959, a B-52 carrying two nuclear weapons and a KC-135 refueling plane collided midair. Both planes and both bombs fell to the ground. The crash killed four crew members, and the two nuclear weapons were only slightly damaged. No radiation leakage was detected. On January 24, 1961, a B-52 carrying two three- or four-megaton nuclear bombs was over Goldsboro, North Carolina when it suffered the structural failure of its right wing. The aircraft broke apart and the two nuclear weapons were released. On one bomb, three of its four arming mechanisms had activated. The second bomb plunged into a muddy field, and its tail was discovered 20 feet below ground. A decision was made to leave the uranium and plutonium in place, and The United States Army Corps of Engineers purchased a 400-foot (120 m) circular easement over the buried components. Had either of the bombs gone off, everyone within an 8.5 mile (13.7km) radius would have been killed. On March 14, 1961 a B-52F-70-BW Stratofortress bomber carrying four nuclear weapons experienced a problem with its cabin temperature. After temperatures climbed to between 125 degrees F and 160 degrees, the crew descended to 12,000 feet and depressurized the plane. After all four engines flamed out, the pilot put the plane into a dive and all crew members bailed out. The plane crashed into a barley field near Yuba City, California, and the nuclear weapons were released. The weapons’ multiple safety measures protected against a nuclear explosion or release of radioactive material. A fireman was killed and several others were injured while rushing to the accident scene. On July 4, 1961, a K-19 “Hotel”-class Soviet nuclear-powered ballistic missile submarine was off the coast of Norway. The cooling system of one of its two nuclear reactors failed, and the temperature of the nuclear core climbed to 800 degrees Celsius, threatening to melt down its fuel rods. The crew and the submarine itself were contaminated by radiation and several fatalities were reported. On October 25, 1962, at the Duluth Sector Direction Center near Duluth, Minnesota, an intruder was shot while scaling a fence around the facility. This triggered a “sabotage alarm”, which triggered a warning at Volk Field in Wisconsin. This alarm triggered nuclear armed F-106A interceptor aircraft to be sent to the source of the original alarm – Duluth. Because of the Cuban Missile Crisis, the U.S. was at DEFCON 3, and there were no practice drills, everything was the real deal. When Duluth communicated that nothing was seriously wrong, the planes were only stopped by a car that raced down the runway after them. The intruder turned out to have been a black bear. On January 13, 1964, a U.S. B-52 carrying two nuclear bombs suffered severe turbulence, and its vertical stabilizer broke off. The crew bailed out and the plane crashed near Savage Mountain outside Barton, Maryland. The bombs were found “relatively intact in the middle of the wreckage”. Three crewmen were killed as a result of the accident. On December 8, 1964, at Bunker Hill Air Force Base, Indiana, several Strategic Air Command (SAC) aircraft were taxiing down a runway. The jet blast from one aircraft caused the plane behind it to slide off the runway and catch fire. The five nuclear weapons onboard the plane burned, but radioactive contamination was limited to the immediate area of the crash and was subsequently removed. On December 5, 1965, an A-4E Skyhawk attack aircraft carrying a 1-megaton thermonuclear weapon, rolled off the deck of the U.S.S. Ticonderoga and fell into the Pacific Ocean. The plane, its pilot, Douglas Webster, and the weapon sank in 16,000 feet of water and were never found. It wasn’t until 15 years later that the U.S. Navy finally admitted that the accident had taken place only 80 miles from Japan’s Ryuku island chain, and this caused an uproar in Japan, which prohibits nuclear weapons from being brought into its territory. Sometime during the mid-1960s, in the Kara Sea, the Soviet nuclear-powered icebreaker Lenin encountered problems with its nuclear reactors, possibly experiencing a meltdown. It was forced to dump the reactors into the sea and they have never been found. The most well-known broken arrow occurred on January 17, 1966 near Palomares, Spain. A U.S. B-52 aircraft, carrying four nuclear weapons, collided with its refueling tanker, a KC-135, at 31,000 feet (9,450 m) and crashed over the Mediterranean Sea. Of the four Mk28-type hydrogen bombs, three were found on land near the fishing village of Palomares. The high explosives in two of the bombs had detonated and released plutonium contamination across a 0.77-square-mile (2 km2) area. The fourth bomb, was recovered intact after a 2 ½ month-long search. During the U.S. cleanup effort, over 1,400 tons of soil were sent to a nuclear storage site. On January 21, 1968, a fire erupted onboard a B-52 bomber operating out of Thule Air Base in the Danish territory of Greenland. The plane was carrying four B28FI thermonuclear bombs, and it crashed onto the sea ice in North Star Bay. The conventional explosives detonated and the nuclear capsules ruptured and dispersed their contents, resulting in radioactive contamination. The U.S. and Denmark launched a clean-up operation, but the secondary stage of one of the nuclear weapons was never found. Workers involved in the clean-up operation have been experiencing radiation-related illnesses, and they have sought compensation. On April 11, 1968, a Soviet diesel-powered “Golf”-class ballistic missile submarine sank 750 miles northwest of the Hawaiian island of Oahu. U.S. intelligence determined that the submarine had been carrying three nuclear-armed ballistic missiles and several nuclear-tipped torpedoes. The U.S. Central Intelligence Agency (CIA), partnered with industrialist Howard Hughes to build a specially-designed deep-water salvage ship, the “Glomar Explorer” to recover the lost sub. They were only partly successful when the Glomar raised approximately half of the submarine. Also during the Spring of 1968, the U.S.S. Scorpion, a nuclear attack submarine, mysteriously sank about 400 miles southwest of the Azores islands. Besides the tragic loss of all 99 crew members, the Scorpion was carrying two nuclear-tipped weapons with yields of up to 250 kilotons. On April 12, 1970, in the Atlantic Ocean about 300 miles northwest of Spain, a Soviet “November”-class nuclear-powered attack submarine experienced a problem with its nuclear propulsion system. A merchant ship attached a tow line and attempted to pull the submarine to safety, but the submarine sank, killing all 52 crew members on board. Off the coast of Sicily, Italy on November 22, 1975, twelve years to the day of his assassination, the U.S. aircraft carrier John F. Kennedy collided with the cruiser USS Belknap during an exercise. The collision occurred at night and during high seas. One, or possibly both ships, contained nuclear weapons, but no nuclear contamination was detected by rescue personnel. On September 19, 1980, near Damascus, Arkansas, crewman were performing maintenance on a Titan II Inter-continental Ballistic Missile (ICBM). A crewman accidentally dropped a wrench into the silo, and it punctured the missile’s fuel tank. The missile leaked fuel for over eight hours before finally exploding, killing one and injuring 21 others. The blast destroyed the entire compound, but the nuclear warhead was recovered intact. On October 3, 1986, 480 miles east of Bermuda, a Soviet “Yankee I”-class nuclear-powered ballistic missile submarine suffered an explosion and fire in one of its missile tubes. An attempt was made to tow the submarine, but it sank on October 6, 1986 in 18,000 feet of water, taking its two nuclear reactors and approximately 34 nuclear weapons down to the bottom of the sea. About 300 miles north of the Norwegian coast on April 7, 1989, a Soviet nuclear-powered attack submarine, the “Komsomolets”, caught fire and sank. The vessel’s two nuclear reactors and two nuclear-armed torpedoes were lost, along with 42 of the 69 crew members. On August 10, 1985, at the Chazhma Bay repair facility, about 35 miles from the city of Vladivostok, Russia, an “Echo”-class Soviet nuclear-powered submarine suffered a reactor explosion that released a cloud of radioactivity. Fortunately, the cloud never reached Vladivostok, but ten Soviet officers were killed by the explosion. Also in the White Sea, on September 27, 1991, a “Typhoon”-class nuclear-powered ballistic missile submarine suffered a missile launch malfunction during a test. No other information is available about this incident. In the Barents Sea on February 11, 1992 a collision occurred between a CIS (Commonwealth of Independent States) “Sierra”-class nuclear-powered attack submarine and the U.S. nuclear-powered attack submarine “Baton Rouge”. The Commonwealth of Independent States is comprised of Armenia, Azerbaijan, Belarus, Georgia, Kazakhstan, Kyrgyzstan, Moldova, Russia, Tajikistan, Turkmenistan, Ukraine, and Uzbekistan. The vessels reportedly suffered only minor damage, but a dispute arose over whether the incident had happened inside or outside of Russian territorial waters. On March 20, 1993, in the Barents Sea, the U.S. nuclear-powered submarine Grayling collided with a Russian Delta III nuclear-powered ballistic missile submarine. Both vessels reportedly only suffered minor damage. On August 12, 2000, also in the Barents Sea, a CIS “Oscar II” class submarine, the “Kursk”, suffered a torpedo failure and explosion. The ship sank with all 118 men onboard. No evidence of radiation contamination was detected. On August 29, 2007, at Minot Air Force Base in North Dakota, six AGM-129 ACM cruise missiles, each loaded with a W80-1 variable yield nuclear warhead, were mistakenly loaded onto a B-52H bomber, and transported to Barksdale Air Force Base in Louisiana. The nuclear warheads were supposed to have been removed before transport, but they weren’t..
Once at Barksdale, the missiles with the nuclear warheads remained mounted to the aircraft for 36 hours and were not protected by the various mandatory security precautions for nuclear weapons. The missiles were never reported as missing, by Minot. ICIS 5th April 2019 The commissioning of France’s long-overdue 1.65GW Flamanville 3 nuclear project could face further delays, according to industry stakeholders. A group of experts from French nuclear authority ASN, nuclear safety institute IRSN and utility EDF are set to meet on 9 April to discuss what to do about the welds of the plant’s EPR reactor, IRSN’s director Jean Cristophe-Niel said at a conference in Paris on Thursday. At the meeting ASN could communicate to EDF whether it would want the welds to be entirely rebuilt or just repaired. If ASN does order the welds to be rebuilt this could significantly delay the commissioning of the plant which was previously set for winter 2019-2020.
traders present at the conference said they were not surprised by this possibility given the project’s track record. The recent revelations by Public Enterprises Minister Pravin Gordhan that three separate safety “incidents” had occurred at the Koeberg nuclear power station north of Cape Town in 2014 and 2015 should raise red flags for South African citizens, the Southern African Faith Communities’ Environment Institute (SAFCEI) said on Saturday. “Not only is the executive decision to keep the public in the dark about these incidents problematic, but possible safety issues contradict the South African government’s assertion that nuclear energy is safe, clean, and a solution to climate change,” SAFSEI said in a statement…….. In the SAFCEI statement, Peter Becker of the Koeberg Alert Alliance said, “When something happens at Koeberg, the [NNR] decides whether it should be classed as an ‘incident’ or not. If it is an incident, they need to report on this and the public would be better informed. But, if they deem it to be less than an incident, then they do not need to report on it, and since the public is none the wiser, there would be no public outcry. The question is, how does the NNR decide what to report on and what to omit? And, shouldn’t citizens have some say in what the NNR is obliged to share with them? “While the NNR’s 2014 annual report does mention ‘minor occurrences’, the 2015 report stated that there were no nuclear incidents reported during that period,” Becker said. Government and the nuclear industry were “downplaying the dangers associated with nuclear energy production and have concealed incidents from the public”, SAFCEI’s executive director Francesca de Gasparis said in the statement. “Not alerting the public to nuclear incidents is problematic because it gives a false picture of the realities of nuclear energy production. The issue of access to information, what information is available in the public realm, and who gets to decide what is shared is particularly risky when dealing with this kind of energy production. It makes us ask, once again, whether South Africa needs or wants nuclear energy as a part of its energy future?” De Gasparis said. the planned final repository for spent nuclear fuel in Forsmark. unconditional review of both the old and the new data. Trump’s desire to let industries regulate their own safety doesn’t begin and end with the pork industry. Salmonella and E. coli are one thing. Nuclear explosions, plane crashes, and offshore oil spills are another entirely. …….in many cases, Republicans don’t see why the government itself has to be the regulator. Why should taxpayers pay for federal inspectors to badger businesses when the businesses themselves have an economic incentive not to threaten public health and safety? But the record is clear: Industry self-regulation often fails, and a lot of people wind up getting hurt. ………..The day before the Post’s story on pork inspections broke, the Senate Environment and Public Works committee held an oversight hearing for the Nuclear Regulatory Commission (NRC). The hearing was called, in part, to discuss a new safety regulation designed to protect American nuclear reactors from earthquake and flooding events, like the one that caused the 2011 disaster at the Fukushima Daiichi power plant in Japan. Though the health impact of that disaster so far appears to be minimal, the plant is still not secured—large swaths of land and water remain contaminated, and surrounding villages are still uninhabited. The draft version of the rule, released by the NRC in 2016, required all nuclear plant owners to do two things: reassess all flood and earthquake risks, then implement new safety measures taking the reassessment into account. But in January 2019, with Trump appointees making up a majority of the commission, it approved a final version of the rule making the safety measures voluntary. Nuclear power plants, in other words, will still have to do new risk assessments—but now they can choose whether they want to prepare for those risks or not. The nuclear industry is also pushing the NRC to cut down on safety inspections and rely instead on plants to police themselves. The NRC “is listening” to this advice, the Associated Press reported last month. “Annie Caputo, a former nuclear-energy lobbyist now serving as one of four board members appointed or reappointed by President Donald Trump, told an industry meeting this week that she was ‘open to self-assessments’ by nuclear plant operators, who are proposing that self-reporting by operators take the place of some NRC inspections.”………. WASHINGTON — The Nuclear Regulatory Commission is failing to recognize the full range of dangers posed by a potential dirty bomb attack and needs to take more action to secure high-risk radioactive material, according to a government watchdog report released Thursday. In assessing the possible effect of a radioactive dirty bomb detonated in an American city, the U.S. nuclear regulator has only focused on the possible health effects caused by the spread of radiation, the Government Accountability Office report said. But the NRC has not taken into account the potential consequences of a panic-driven evacuation and costly decontamination effort, according to the report. “NRC’s regulatory approach in many ways is based on the idea that a dirty bomb would not be a high consequence event,” said David Trimble, director of the National Resources and Environment office at the GAO. A dirty bomb uses a conventional explosive combined with radioactive material to spread radiation over a wider area, and some terrorist groups have sought to construct such a device over the years. 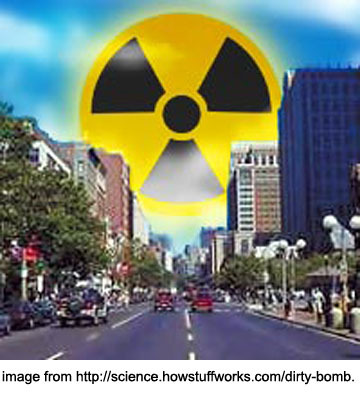 Rather than deaths or harm caused by radiation, the most significant impact of a radioactive dirty bomb would be its disruptive effect, by spreading panic, prompting evacuations, requiring cleanup work and undermining economic activity, said the report, citing experts convened by the National Academy of Sciences as well as other studies. The NRC’s staff operates under guidelines that require it to only evaluate the risk of a dirty bomb based on immediate deaths and other health effects of the radiation released. “If you’re using that as a criteria to regulate, you’re kind of missing the boat,” Trimble said. The fortress-like facility that holds nuclear material and high explosives wasn’t designed to take the quakes the land it sits on can dole out. The Drive , BY TYLER ROGOWAY, APRIL 4, 2019 One of the most important and high-security facilities in the Department Of Energy’s sprawling nuclear infrastructure portfolio could be a radiation hazard just waiting to occur according to the Chairman of the Defense Nuclear Facilities Safety Board. The fortress-like Device Assembly Facility (DAF) sits about 60 miles northwest of Las Vegas within the highly-security Nevada National Security Site (NNSS)—previously called the Nevada Test Site—near Yucca Dry Lake. The NNSS is surrounded by the Nevada Test and Training Range (NTTR) with shadowy neighbors like Area 51. The entire area continues to have massive strategic importance as evidenced by a recent Russian surveillance flightdirectly over the NNSS that occurred according to the rules of the Open Skies treaty. It turns out that the area is at a much higher risk to powerful seismic activity than the DAF’s designers realized decades ago. Considering that the potentially seismically vulnerable installation houses nuclear material and high explosives, and these compounds are manipulated inside the facility, a large quake could have terrible consequences. The issue was first reported on by Gary Martin of the always great Las Vegas Review Journal. “The Defense Nuclear Facilities Safety Board is concerned that the Department of Energy has not adequately addressed the seismic hazards for the Device Assembly Facility at the Nevada Nationatinal Security Site. The DAF probabilistic seismic hazard analysis update in 2007 identified a significant seismic hazard increase… A seismically induced high explosive violent reaction could result in unmitigated dose consequences to the offsite public… The facility continues to operate without accounting for the increase in seismic hazard and without evaluating whether the credited structures, systems, and components can perform their safety function during and after a seismic event.”……….. The report goes on to talk about all the systems in place to help mitigate risk to the public during an accident and notes that these systems may not meet the current risk requirements. The same goes for the overhead crane systems, ducts, conduits, and other infrastructure contained in the facility. All of this is quite timely as America’s aging nuclear infrastructure is taking center stage once again as the Pentagon pivots towards focusing on what it calls “great power competition.” This includes not just modernizing America’s existing nuclear arsenal, but also adding new nuclear capabilities like low-yield tactical nuclear warheads that can be mounted on cruise and ballistic missiles. With new nuclear weapons come the need for billions of dollars worth of testing and development and they have to be assembled and maintained somewhere over the course of their service lives. With these developments in mind, it is quite possible, if not probable, that the DAF will see a substantial uptick in operations in the coming years, not the other way around. ………. The potential vulnerability of the DAF to earthquakes is just another reminder of America’s rickety nuclear infrastructure that supports the strategic deterrent. Some have said it is not a matter of if but when a major nuclear issue occurs at one of these sites due to lack of maintenance, upgrades, and a robust long-term plan for storing nuclear waste. Even concerns about security in and around America’s nuclear stockpile have been raised. Scares of multiple types have occurred recently, some of which seem to underline these concerns. IAEA Director General Yukiya Amano, Washington, DC, USA Center for Strategic and International Studies, 5 Apr 19 “………Despite positive developments such as the introduction of the additional protocol, we face some challenges in our nuclear verification work. The world in which the IAEA implements safeguards today is very different from that envisaged by our founding fathers in 1957. Nuclear proliferation is now easier than it has ever been. Globalization, new technology and modern communications have made it possible to access knowledge, materials and expertise that were previously not widely available. Many countries, both developed and developing, have made great technological progress. Technology that could be used for the development of nuclear weapons is no longer out of reach. The steady increase in the amount of nuclear material and the number of nuclear facilities under IAEA safeguards, and continuing pressure on our regular budget, are among the key challenges facing the Agency today. The amount of nuclear material in the world is growing every year as countries make more use of nuclear power and other peaceful applications of nuclear technology. Nuclear material no longer in use, and nuclear facilities that have been shut down, also remain under safeguards………. for some years, the IAEA has had to undertake verification activities against a background of close to zero budget increases. This year, our budget has actually been cut. Our safeguards budget last year was around 142 million euros. Since 2010, it has increased by only 6.3 percent in real terms.